Two-vehicle head-on crash near Dry Lake in Sardine Canyon, US-89/91 (Courtesy: Tim Lindsay). An 87-year-old Hyde Park woman was killed Tuesday afternoon after a two-vehicle head-on collision in Sardine Canyon, US-89/91. Bonnie Joy Reeder was the passenger in a gray pickup truck, reportedly driving the wrong way in the southbound lane. 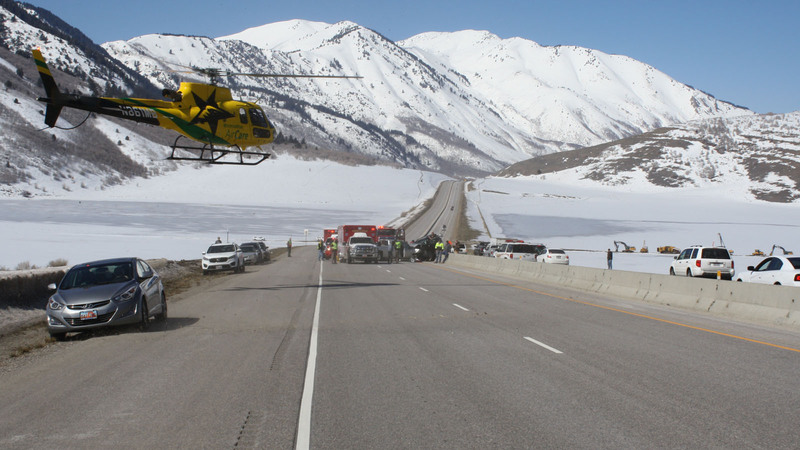 Utah Highway Patrol Lt. Lee Perry said the crash occurred in the Dry Lake area, near mile post 11, around 2:13 p.m.
Air Care helicopter responding to two vehicle head-on crash near Dry Lake in Sardine Canyon, US-89/91 (Courtesy: Utah Highway Patrol). The truck was being driven by Reeder’s husband, 88-year-old Martin Reeder. He sustained non-life threatening injuries and was transported by ground ambulance to Logan Regional Hospital. Bonnie Reeder was in critical condition when paramedics arrived on the scene. She had a faint pulse before an Air Care helicopter transported her to Ogden Regional Medical Center, where she was later pronounced dead. The truck struck an SUV and pushed it onto the barrier. The driver, 32-year-old Brian Alvey from Cottonwood Heights, was trapped inside and had to be extricated by emergency crews. He was also hospitalized with non-life threatening injuries. Perry said troopers believe that Martin Reeder became disoriented when he crossed into the wrong lane. Troopers closed both southbound lanes for almost two-hours while crews investigated and cleared the crash. Northbound traffic was reduced to one lane. Perry said they believe all three people were wearing seat belts. CVD seems to have accurately told the story.